Since it is Sunday and I have the time, I'll add a little history to the thread and a very different operation from what we have seen before on CV forum. 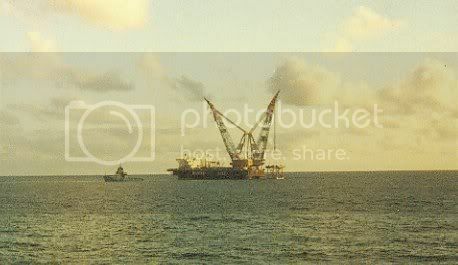 This is two major towage operations I was involved with while working as Tow Master for Micoperi SpA in 1989. Both operations were in Norway. 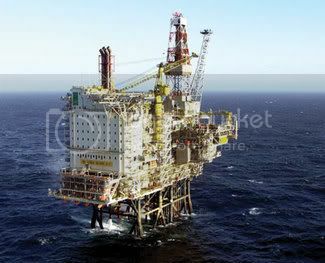 The first was the Veslefrikk Jacket tow from Vaerdal to Songnesjoen and on to the Veslefrikk Field in the North Sea. 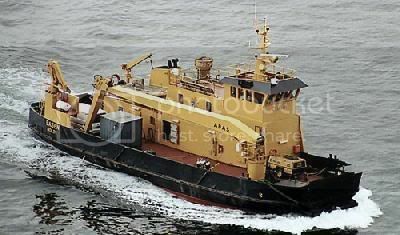 The Barge used was "M-44", 180 m. Loa and abt. 60,000 Dwt. owned by Micoperi. The Veslefrikk jacket was abt. 9,300 m.t. in weight (9,800 m.t. including slings and spreaders) and built to be lifted, not launched, from the barge. Finally to be up-ended and placed over a pre-drilled template on the seabed in abt. 175 m. water depth. 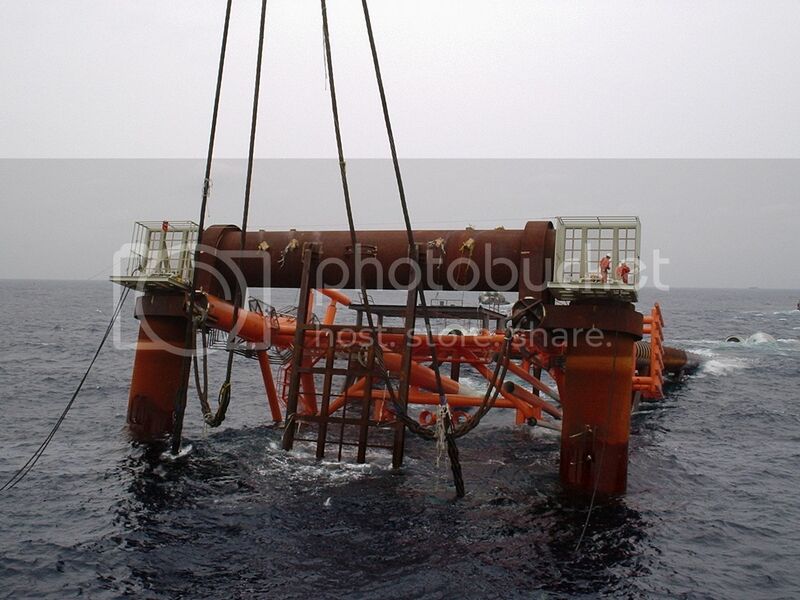 This operation was performed by the Crane Vessel "Micoperi 7000" (now "Saipem 7000"), which is able to lift 14,000 m.t. in ideal conditions. This was to be a world record lift for a Crane Vessel. 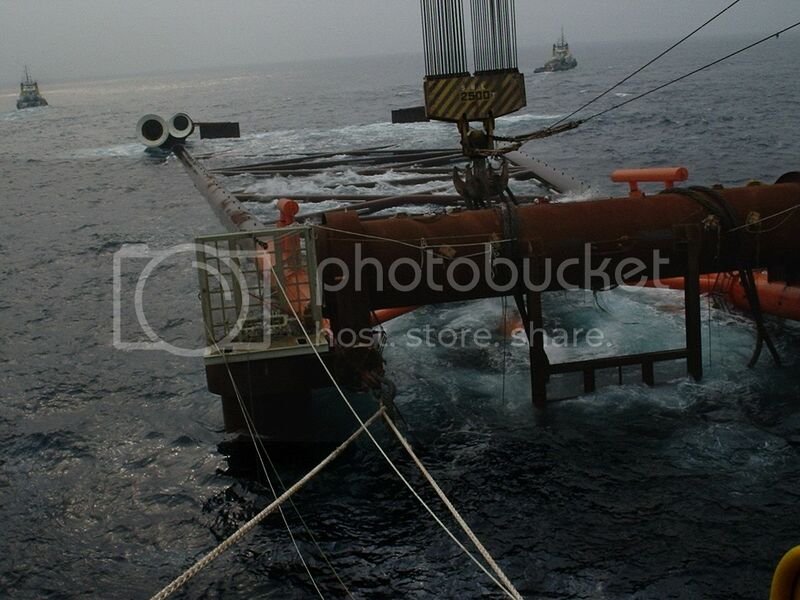 Only a couple of months before the operation was to be performed it was found that the possibilities of getting good enough weather to do the lifting operation on the offshore field was only 2%, even in the months of May or June. 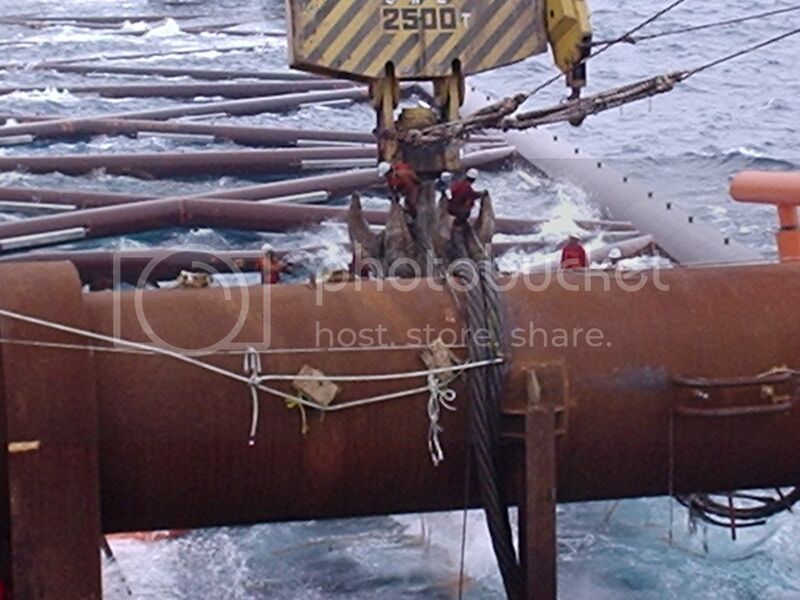 All plans had to be changed and the lifting was performed inshore, in Sognesjoen, where the conditions were suitable. The problem was that the jacket was not designed to be towed and nobody had any experience with such towing operations over such distances. Lots of fast track engineering was needed. 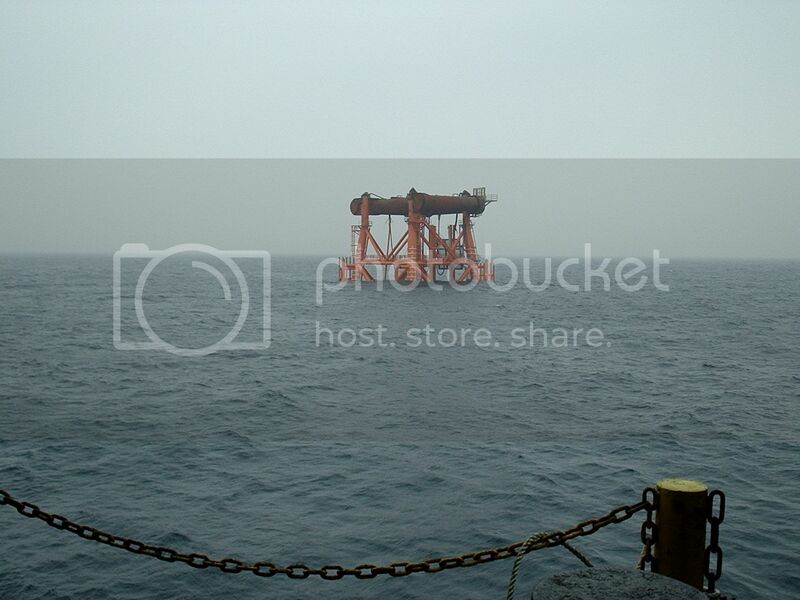 Remember, under that jacket is a 60,000 Dwt. barge. As we proceeded the weather forecast suddenly changed to a force 9 gale and I decided to seek shelter in Vartdalsfjorden, near Aalesund, where we spent three days circling while waiting for the gale to blow itself out. Due to the width of the jacket and the weight we had to ballast down the barge until the stern was under water to be able to clear the cribbing. I had the "honour" of walking along the barge deck to check that there was clearance all along. I can tell you that you feel small when walking under 9,800 m.t. of jacket hanging in two cranes, but I did wear my hard hat and safety booths. 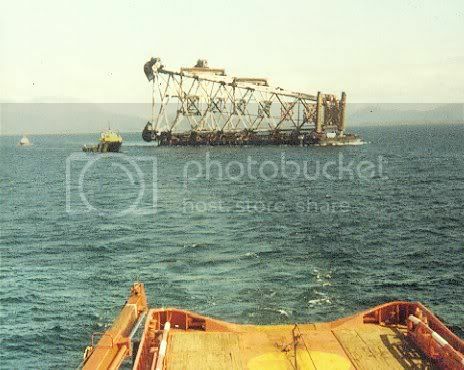 Once I had towed the barge away from under the lift, the jacket was lowered into the water until it was afloat on its own buoyancy and we moved it away to prepare for the tow to field, which was something like 30-40 n.miles out of the fjord and 120 n.miles offshore. This is the Veslefrikk Field in operation. 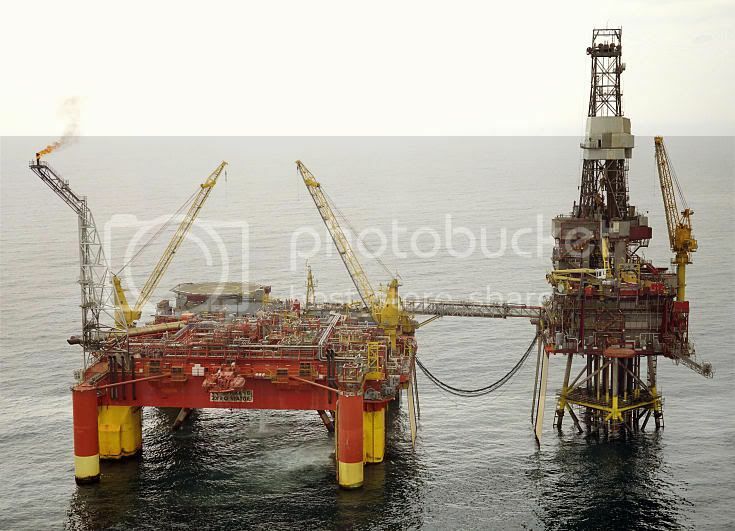 The only field in the North Sea with a floating production unit and a "slim jacket" with only the drilling rig on top. That skinny little bit right at the bottom below the cellar deck is all that is visible of the jacket. Last edited by ombugge; October 9th, 2010, 11:03. 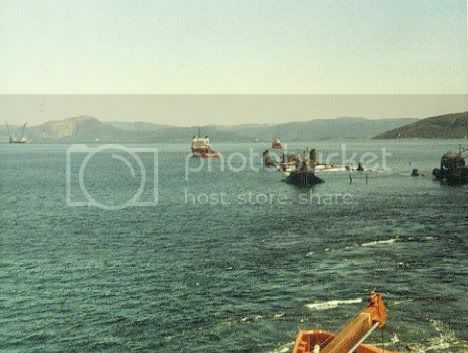 The second towage operation was in Sept. 1989, also from Vaerdal, but this time to the Gyda Field, offshore Norway. 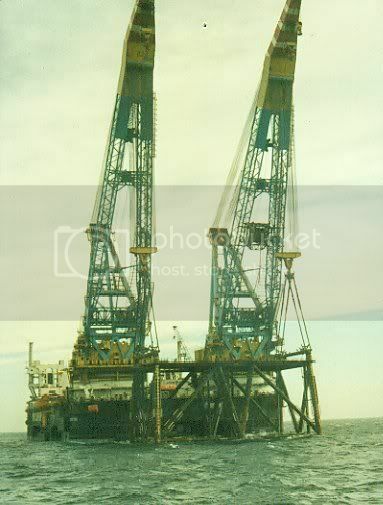 The same Barge (M-44) and the same Crane Vessel (M-7000) was involved. The lead tug this time was the British tug "Salvageman". When we eventually got good enough weather and forecast to proceed to sea, I was planning to take the inshore route for the first bit to save some time, until I realised that there was an electric cable across the Rovdefjord with "only" 120 m. free sailing height. I quickly changed my mind and went back the way we had come in. When we got to the field the M-7000 was ready to lift but the weather window was very short, this being already late Sept. and the first few autumn storms had already passed. Within a few hours the next storm came through and I spent something like 18 hrs. on the barge before it was safe to transfer back to M-7000. 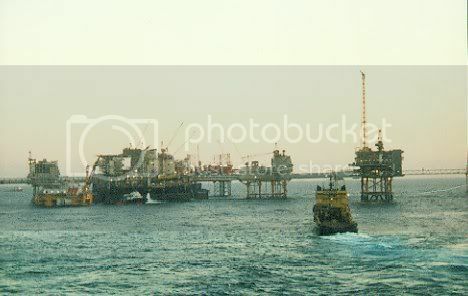 This was my last job for Micoperi as the went bankrupt and was eventually "sold" to Saipem, but we were then planning on lifting a 11,000 m.t. deck structure onto the Sleipner concrete platform while on DP and with both units floating. The tolerance of accuracy was 2 inch. And before you ask; no, it did not go bankrupt because of my delaying the tow in Vartdalsfjorden. Last edited by ombugge; October 9th, 2010, 11:04. That "toy boat" floating inside the tub is actually a full size vessel, just to illustrate the dimensions of this barrier. It is mid-summer and near mid-night. Beautyful weather. 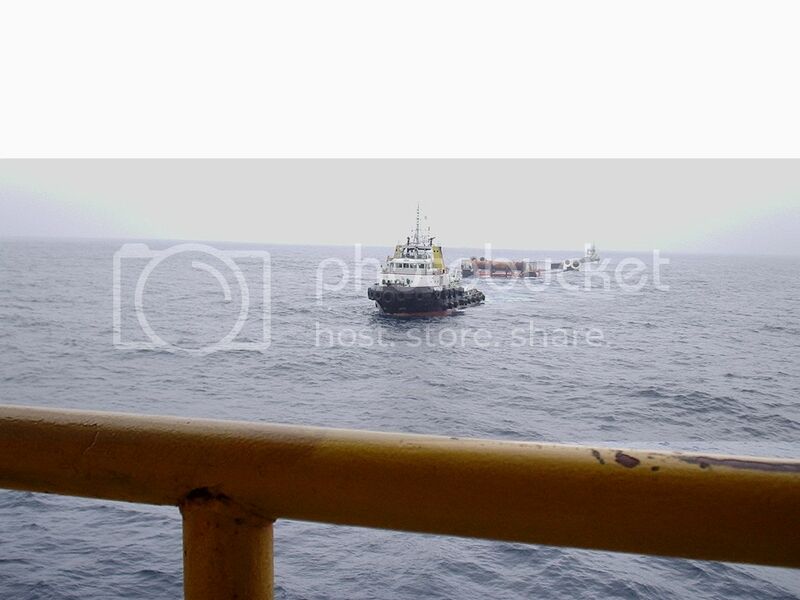 This was the largest fleet of big tugs ever assambled for a single job and the spot market rate in the North Sea has never been higher then when this operation and the Gullfax C tow took plase nearly simultanuously. Due to the draft of abt. 67-68 m. we could not take the direct route to Ekofisk Field. We had to skirt the "shallow" banks to the north by going into British sector and approach Ekofisk Field from the SW. I had long left by that time. The production equipment has been removed, but it would be too difficult and expensive to remove the 1 million tonnes Tank and the barrier, which is filled with sand dredged up in the vicinity and probably weigh about the same. As said on the new "Floating Crane" thread, the "Supply Ships" thread has been badly abused, mainly by me. I therefore take the liberty to propose starting a few new threads to separate the various Offshore Oil & Gas subjects for better clarity. 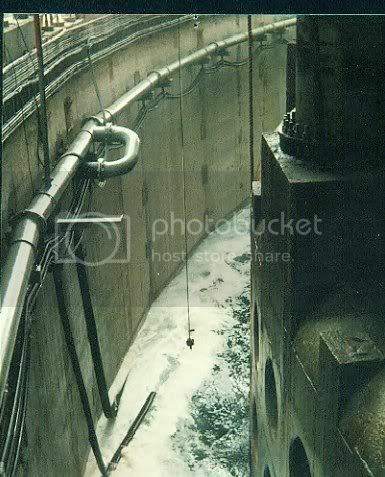 In 1984 the seabed around Ekofisk was found to be subsiding at a rate of about 0.5m per year and the total subsidence expected to reach 6.0 m. This subsidence made it necessary to protect the existing installations against severe wave action due to the fact that an increased part of the structures were submerged with consequently a reduced air gap. The field lay-out of the Ekofisk Complex is presented in Fig. 1. 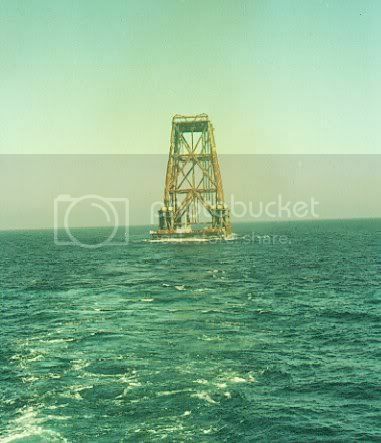 The topsides of all the jacket structures and all the bridges were raised 6 m in a jacking operation in summer 1987. However the design and lay-out of the concrete 2/4 Tank (see Fig. 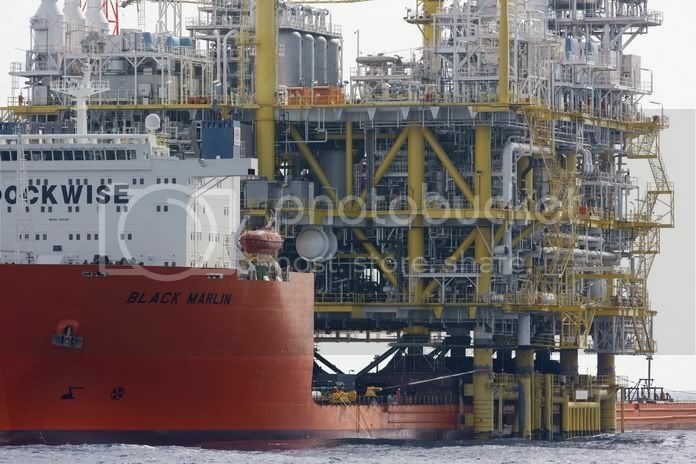 2) including the two main decks at +90m and +100m above seabed level with all the modules and processing equipment did not allow for a jacking operation. 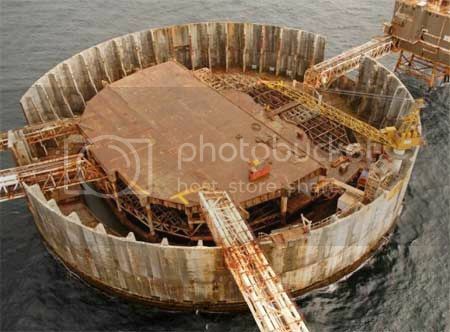 As subsidence of this magnitude was not accomodated within the original design Phillips Petroleum Company Norway(PPCoN) and their partners investigated alternative solutions to protect the 2/4 Tank topsides and finally selected a Protective Barrier structure forming a complete ring around the existing 2/4 Tank. This is shown in Fig. 3. 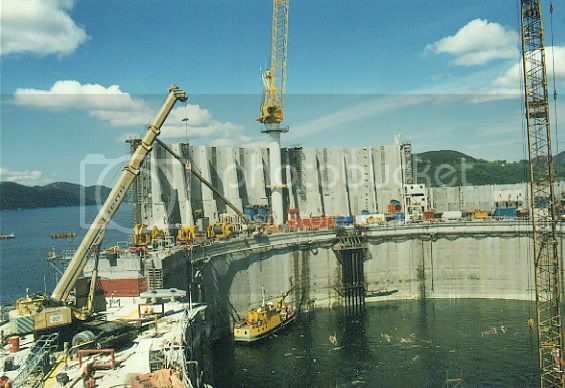 In February 1988 Peconor Ekofisk A/F was awarded the contract for the detailed design, procurement construction and installation of the Protective Barrier. Peconor Ekofisk A/F is a joint-venture of three Norwegian and two dutch companies. In Refs(l) and (2) a review is given of detailed design aspects of the structure and its foundation, whereas in Ref(3) information on hydrodynamic analysis and model testing programmes being part of the detailed design work is presented. A general review of the marine design work is outlined in Ref(4). 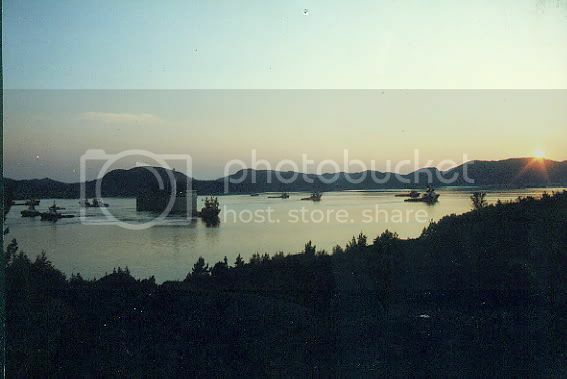 Source: Offshore Technology Conference, 7 May-10 May 1990, Houston, Texas. 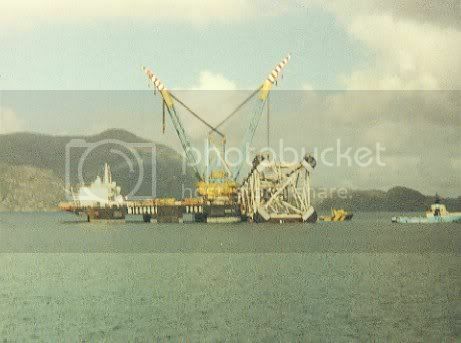 After an engineering and construction period of sixteen months in June 1989 both halves of the Protective Barrier for the Ekofisk 2/4 Tank were ready for tow-out and installation. 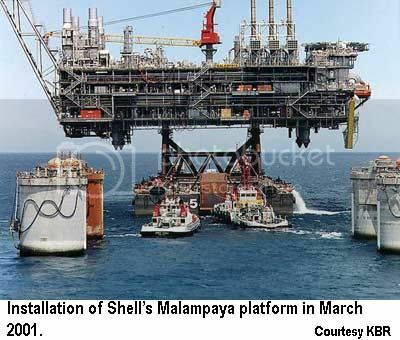 To enable installation of both halves immediately after each other both structures left the inshore construction site with approx. 1 day in between. Consequently two towing fleets had to be mobilized totalling 18 towing vessels with 2215 t bollard pull, the largest towing fleet ever assembled. At the Ekofisk Field during the approach to the 2/4 Tank the structures had to pass neighbouring installations with clearances down to 10 m. Arriving close to the 2/4 Tank clearances during manoeuvering reduced to 2 m, whereas the acceptable final positioning inaccuracy was less than 0.20 m, over the full height (84m)of the joints between the two halves. 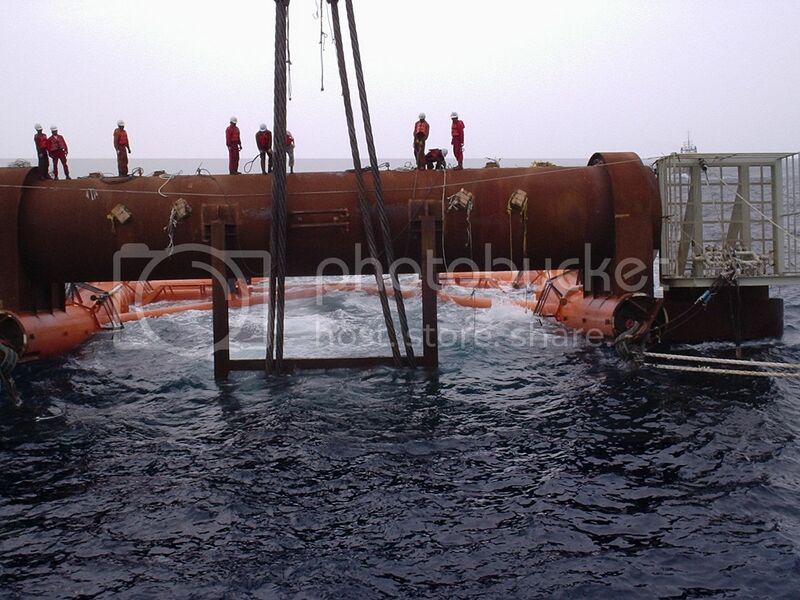 To enable this complex and critical operation in a fully operational Ekofisk Field (as a shut down was not acceptable), several installation systems and facilities were used, together with detailed preparation of the activities and training procedures of the responsible personnel. The installation was completed successfully and the required installation accuracies were met. The achieved position accuracy at the seabed was within 0.05 m of the target. This paper outlines several operational aspects of above described towing and installation and shows the feasibility of positioning large gravity structures with very high accuracies. Maybe an idea to move the following posts from the Supply Ships thread to this thread: # 108, # 109 & # 121, as they fit better under this title. I also propose to start a new thread for; "Rigs, Platforms and Oil Fields etc." to clean up the "old" thread. 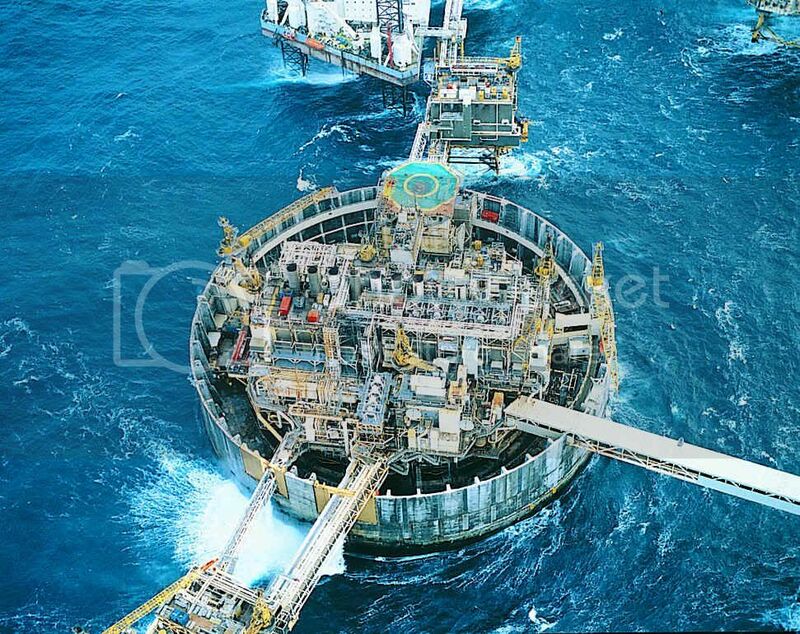 FPSO/FSO is a part of an Oil Field so they should also fit in here. 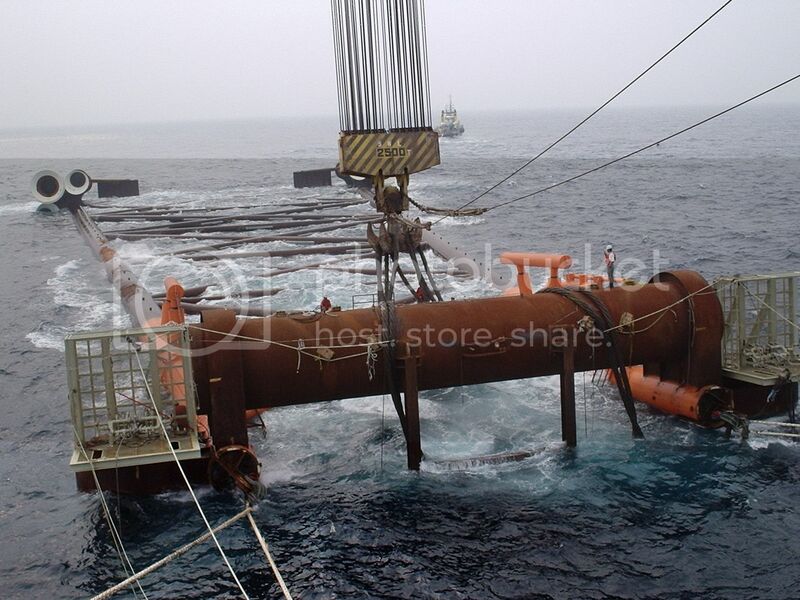 Offshore Construction, Pipe laying and related operations can be thrown in with the Crane Barges in the new Floating Crane thread, as most such operations are done with combined Derrick/Lay Barges (DLB). Floatels and Accommodation/Work Barges falls more or less into this same category, as they are used mainly during construction. That should pretty much cover the Offshore Industry. I can start the threads with some new posts over the next few days/weeks, but I don't know if I have the authority and knowledge to move posts between threads. Don't worry. Your post was read and I looked closely at each picture for a very long time trying to figure out what was happening. Your description was very good and you answered most of my questions as I read the post. 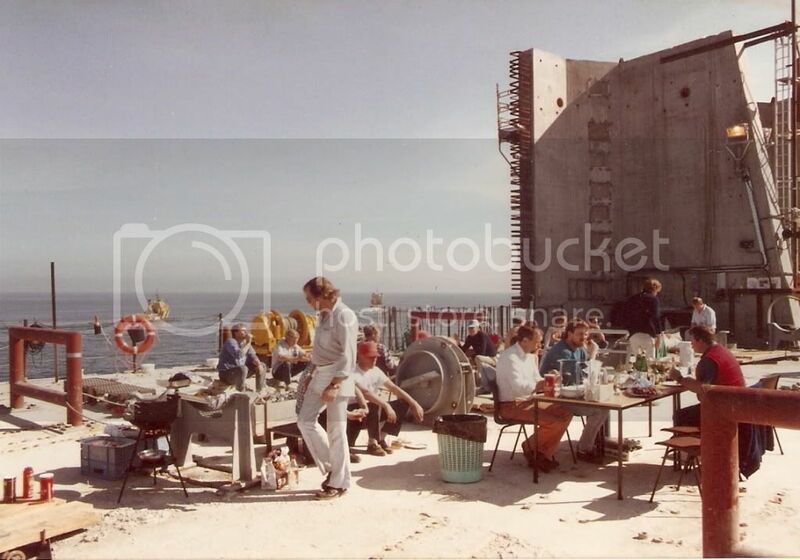 And, I did not want to comment on the hair cuts in the barbeque picture . It is hard to provide too much information on this forum. Ombugge, I have come to the conclusion that the word 'small' is not in your vocabulary! I love seeing these massive operations, and some of your photos really do out the size of some of this kit into perspective. 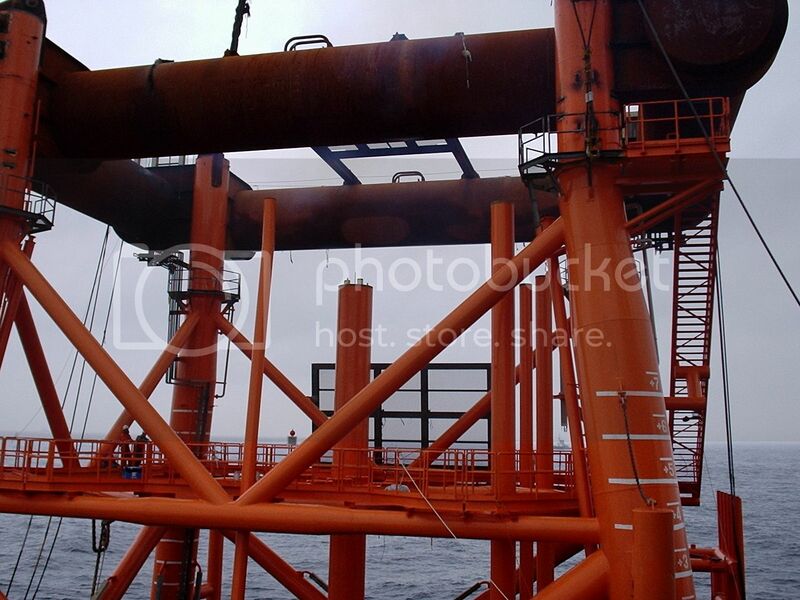 For example, the photos of the Ekofisk Barrier, the ship inside really shows how big that thing is! Like you say, the ship looks like a toy boat! From the photo she looks similar to some of the older RFA ships. Oh yes, it does. just look at a post on the Fishing boat thread a few days ago. I can assure you, I don't get involved in that type of operations any more. The pressure is tremendous and for younger people to deal with. This is where cross-discipline thinking and knowledge comes in. 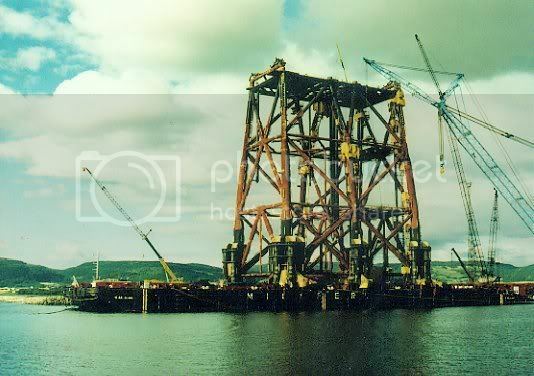 That trick bit could be constructed on dry land anywhere, loaded and transported to the bridge site and set in place by HLC or Transport Barge(s), using the Float-over method. 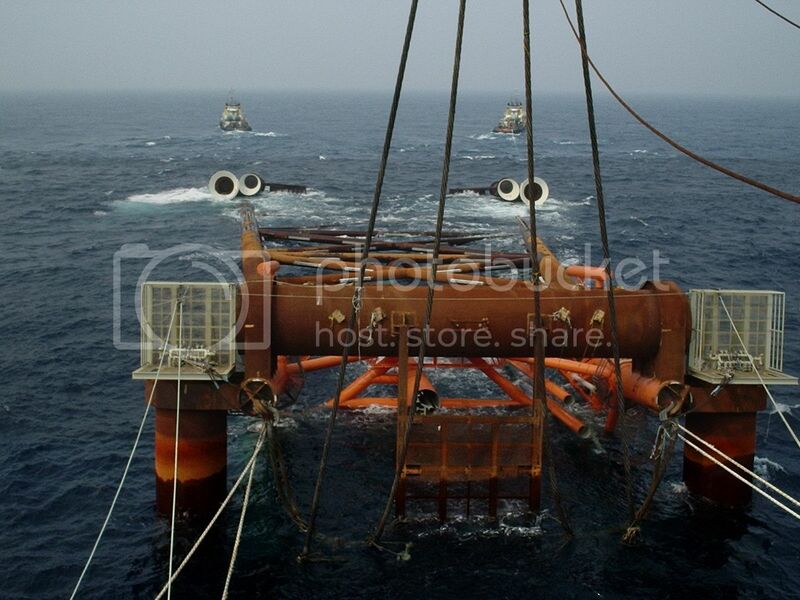 Or using a combination of the above and an Offshore Crane Vessel for the final installation. Piece of cake. Not to let this thread just fade away on page two, here is a couple of float-over operations done in this region. 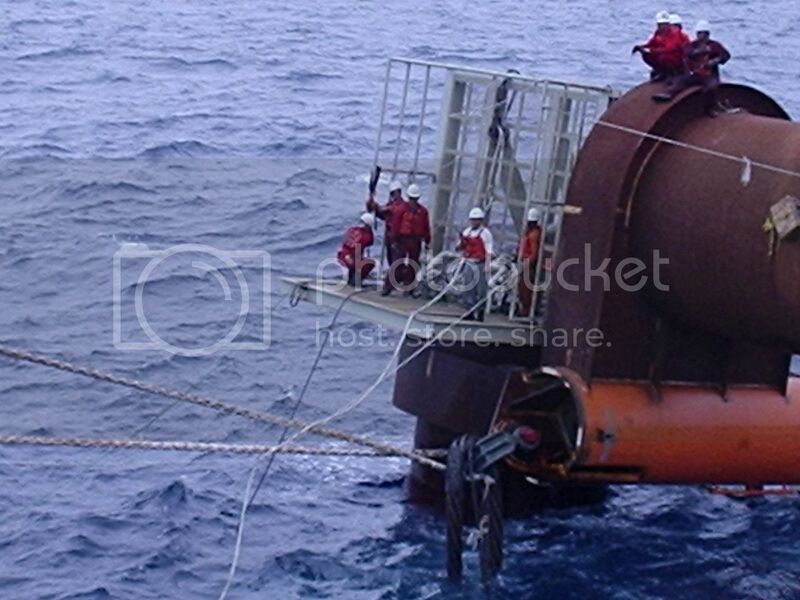 A simple way of transporting and setting an entire Topside packet, or just a deck structure, onto a jacket at sea. No need for expensive Crane Vessels. No, I was not involved with any of these two operations, but I have done a similar operation in the Mahakam Delta, some 10 years ago. Not as heavy as this (abt. 4,500 m.t) but complicated because it was way up a relatively narrow river, with strong current and very limited water depth. As said earlier, same principle can be used for installation of low bridge spans. Float-over was used to install the new "Stromsbrua" in Skodje some years back, but I haven't been able to find any pics from that operation. Time to revive this thread, which has been dormant for a long time. Inspecting the Launch Barge S-45 a few days ago gave me the idea to show you the process of launching Jackets from a barge offshore. Here is a couple of YouTube links. I had nothing to do with this project. The above was taken from You Tube. This project was performed by Heerema, using the SSCV Thialf, which has been featured several times in another thread on CVF. I will see if I have some pictures from a project in China I was involved with, which nearly went wrong. If so I will post them here soon. Pics from the Launch Barge S 45 will be posted in an appropriate thread. 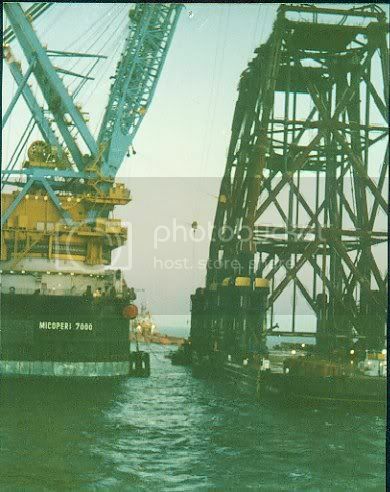 As said in the above thread I have dug up some pictures from the installation of the HZ19-3 Jacket for Agip, off the Pearl River Delta, China, in March 2004. 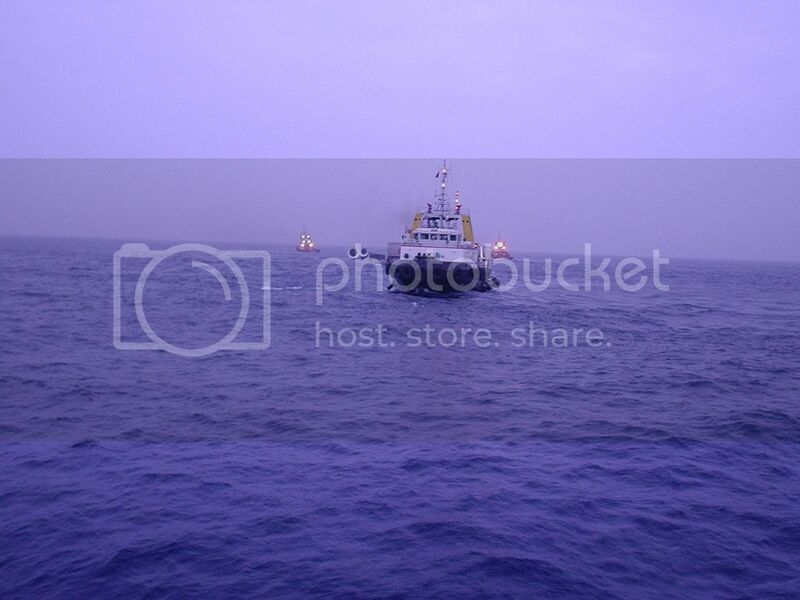 I got to Shekou 1. March, 2004 but did not get on board the Crane Barge as a tire exploded on the Helicopter on take-off. As it was still NE Monsoon season the weather was far from ideal, so no flights where possible the next day. I returned to Singapore on 4. March to await better weather forecast. The Jacket had already arrived several days ago on board the Launch Barge HD 1006. We waited for a lull in the Monsoon for several more days. Finally on 11. March, 2004 we received a favourable forecast for 48 hrs. and I signed Certificate of Approval to commence launching off the barge. 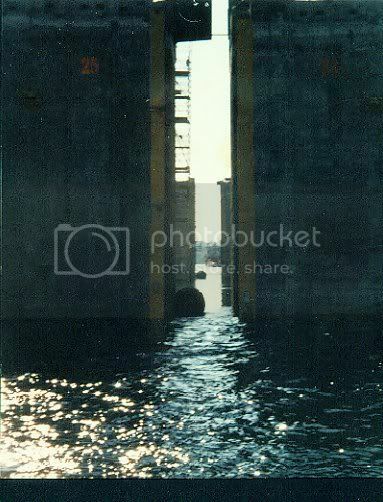 I could not find any pictures of the actual launching off the Transport Barge, but the process was much like what is shown in the links in the post above. That is when the problems started. This jacket was not self- upending, (like shown in the links above) The next step was to blow the "rupture discs", which had been placed to avoid the legs of the jacket filling prematurely. This failed since the compressor to be used had been damaged in transport. After some inovative thinking we managed to blow 7 of the discs, but not the last 4. Meanwhile the weather deteriorated. It was necessary to get the jacket upended quickly by filling water "from the top" with hoses, which worked. By 0900 hrs. Saturday, 13 March the weather had deteriorated to where we could not be positioned over the Template on the bottom due to heave. The jacket was now upright and stable as long as it was kept at a certian depth. We secured the jacket to the stern of HD 2500 at a hook load of only 600 - 650 m.t or so to wait for another lull, which was expected within 18-24 hrs. But at 1225 hrs. the Crane operator descided to lower the jacket to get his people off, without telling anybody, which resulted in the jacket becoming unstable. When the Crane Operator noticed tension increase to over 1,200 m.t. he left the crane and refused to go back up. 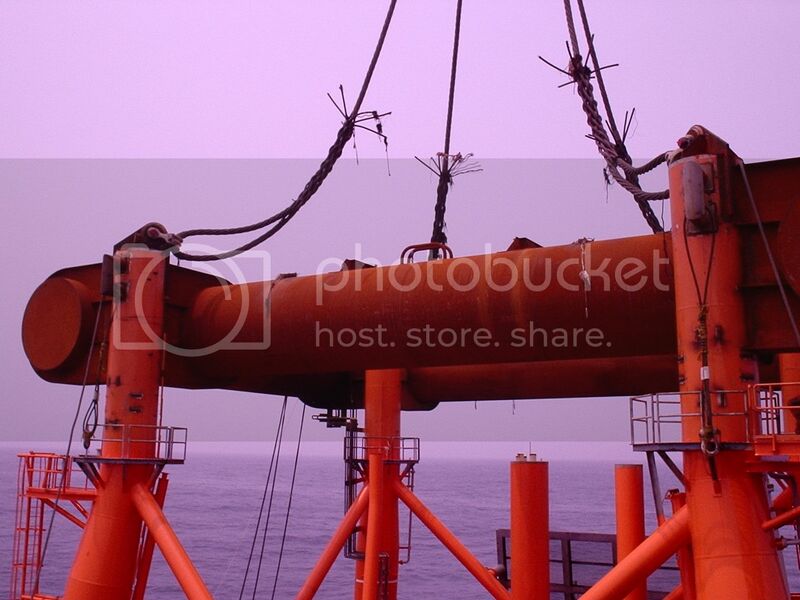 Another Crane Operator evetually manage to lower the jacket to a stable position at around 650 m.t hook load. The next day, as the weather had deteriorated further and the forcast was not good, it was decided to add more mooring lines and to de-ballast the legs. The situation remained the same until 16. march, when there was a short weather window. Not long enought to upend and set the jacket, but sufficient to get the jacket away from the HD 2500, before the weather deteriorated further. The jacket was towed in circles around HD 2500 by the two Britoil tugs until 27. March. 11 days with many of the rupture discs on the jacket blown and only the air valves holding the water to flood the legs. Not a very good situation to be in. It looked like another weather window, long enough to unend and set the jacket was in the offering, finally. The weather forecast for the next 48 hrs and outlook to 72 hrs. 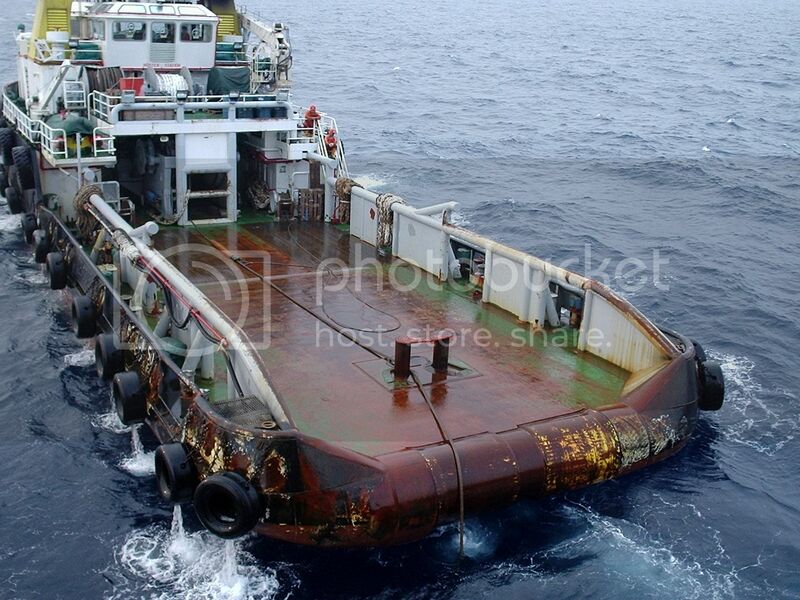 was within the criteria of 1.5 m. seas and it was approved to commence the upending operation.